Blue Curve Comply combines a Disclosure Database, a configurable set of Business Rules and an off-the-shelf set of standard Disclosure Components. This unique and flexible design ensures you always display the correct disclosures in the way you want. Using Comply with Blue Curve Process, Disclosures are automatically inserted into each research document. You decide what goes into the document by configuring the Business Rules, and the data is always displayed using the same design as your documents or website As standard, Comply gives you Rating Plotter Charts, a Spread of Recommendations table (using Insight data), Meaning of Recommendations Table and specific company Disclosures in the format you desire. Comply stores an audit trail of all changes to the Disclosure Data, meaning that you can make disclosures at any point in time. Simply set the disclosure date and be confident that what's displayed was accurate at the time. Have the flexibility to make disclosures in real-time, or at the last quarter-end. You decide. Comply gives you a database to store standard information for disclosure purposes required by most jurisdictions. But you decide how you want to display that in your documents and on your website. Have the flexibility to display disclosures with the wording you want and the format that suits you. Comply is multi-jurisdictional, meaning that it can produce a different set of disclosures, with different wording, depending on the jurisdiction you want to comply with. As standard, Comply comes configured with FINRA compliant rules, but can easily and quickly be reconfigured to suit your needs. And if you're the type of firm who needs to produce research with two or even three different disclosure sets for different jurisdictions (and even in a different language), then Comply can handle that as well. Ensuring your document disclosures are correct is just one part of the puzzle. As more "research" content is produced on-line, it's doubly important to have all your disclosure data available on-line as well. That's why Comply ships with a standard Disclosure Portal that provides your customers with up-to-date and clear disclosure data on every stock you cover. 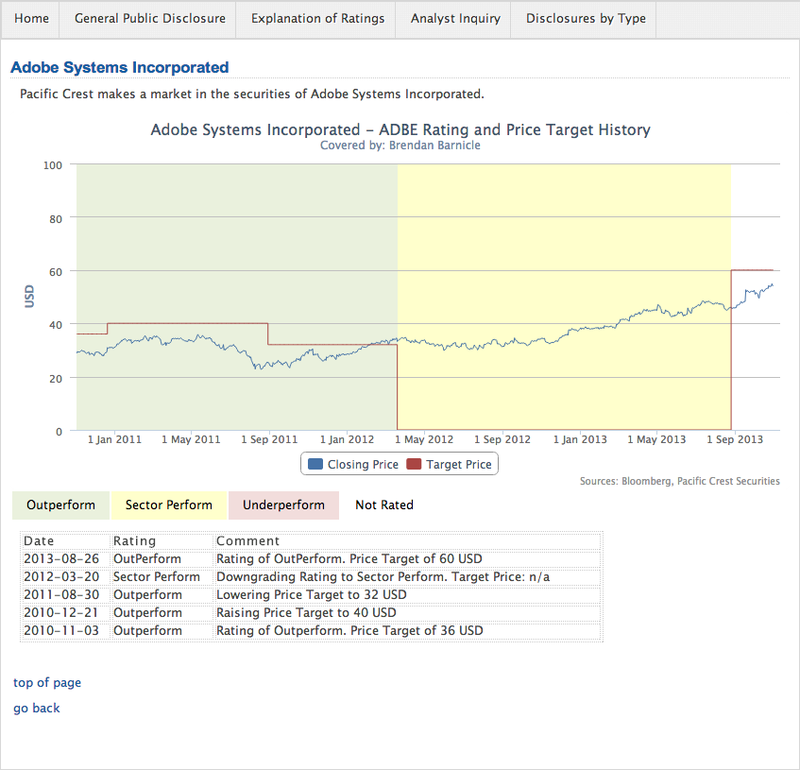 The Disclosure Portal provides a window into the Comply database, and displays Ratings Plotter Charts, Changes in Recommendations/Price Targets, specific Company Disclosures and any specific Analyst Disclosures. Users can access the Disclosure by Company or by Analyst and can also view your general disclaimers, Spread of Recommendations and Explanation of Ratings. And, of course as with all Blue Curve web interfaces, it can be tailored to your corporate design. Compliance is quite often a bottleneck in the research production process, but if not carried out correctly can cause significant embarrassment, or worse. Blue Curve Comply acts like a black box for the research production process, allowing it to run quickly but also with reduced risk. How can that be? Combining Process and Comply allows you to automatically insert the correct disclosures during the production process using a workflow Event. But Comply also includes Business Rules that check whether the document needs to be checked by the Compliance department or not. If the Business Rules approve the document it can go out immediately, safe in the knowledge that there's nothing in the document to cause a problem. To support the automated approval process: Comply can look inside each document for restricted words and phrases; it looks for Tickers or Company names that have not been disclosed against; and, it also checks whether any company mentioned in the document is on any restricted, grey or quiet list indicating possible investment banking activity. Of course, the exact business rules are configured t your precise needs, but when set up correctly our customers tell us that more than 70% of their research goes out the door without any physical compliance check at all ! Now that's powerful.